Aviation record keeping... without the aviation price tag! CharterLog includes a template-based reporting system which can be customized and extended to meet your reporting needs. To learn more about the capabilities and features of CharterLog XMS, use the menu links to the left. A flight is "launched" by creating a new Flight Records, specifying the departure date and route (legs), and assigning an aircraft and a crew. The Flight Launch Wizard guides the user through the process. 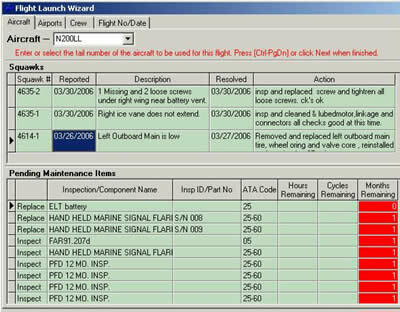 Relevant pilot currency and aircraft maintenance status information is displayed, allowing these factors to be reviewed when selecting aircraft and crew. During the flight, the crew records detailed information for each leg including departure and arrival times, on-duty/off-duty, meter readings, passenger count, fuel burned, fuel purchase, weight and balance information, squawks (if any), VOR and RVSM checks performed, remarks, and crew logbook entries. 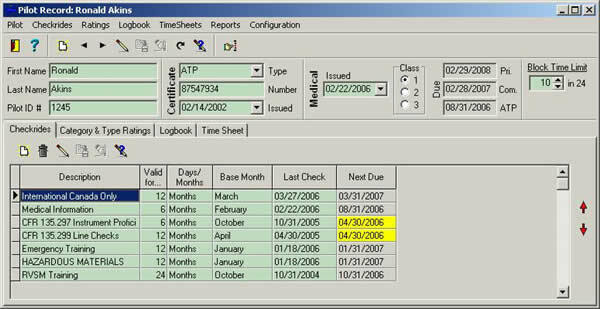 At the termination of the flight, information from the completed paper form is entered into the Flight Records window. When the record is completed and verified, it is "closed". The closing process automatically posts logbook information for each crew member to the Pilot Records database, hours and cycle counts for airframe and engines to the Aircraft Records database, and updates VOR check and Squawk records. CharterLog XMS stores all of the information necessary to track certificates, ratings, check rides, flight time and duty time for each pilot flying for the company. All of the pilot tracking features, including reports are accessed from the Pilot Records window. Independent "base months" and last-completed dates can be maintained for 293 Checkrides and the associated testing. Flight duty time is automatically logged when Flight Records are closed. A variety of pilot "status" reports can be printed, including the Flight/Duty report -- a graphical plot of a pilot's flight and duty times for each calendar month. Click on the report names in the menu to the right to view sample reports in Adobe Acrobat format. CharterLog XMS's comprehensive Aircraft database tracks aircraft times, discrepancies, maintenance and work history (work orders). All of the aircraft tracking features, including reports are accessed from the Aircraft Records window. 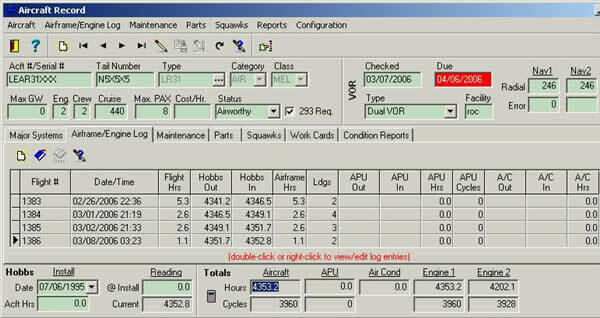 The Airframe/Engine log (shown in window above) records time logged on the aircraft. The majority of the entries in this log are posted automatically via the Flight Log. Entries can also be posted directly from the Aircraft Records to log time not associated with a Flight Record. Installation, current times and overhaul information is tracked for the Engines, APU and Air Conditioner. A discrepancy log is maintained for each aircraft. Discrepancies are normally entered into the Flight Log and posted to the aircraft when the Flight Record is closed. Discrepancies can also be posted directly from the Aircraft Records window. Discrepancies noticed during ground operation and handling of the aircraft by maintenance staff are usually posted in this manner. An unlimited number of recurring Maintenance Actions and life-limited Parts can be tracked for each aircraft. Maintenance Actions and Part life limits can be based on hours, cycles, months, or any combination of the three. Hours or cycles based items are updated in accordance with the hours/cycles on the Aircraft System (Airframe, Engine [n], APU, or A/C) they are linked to. 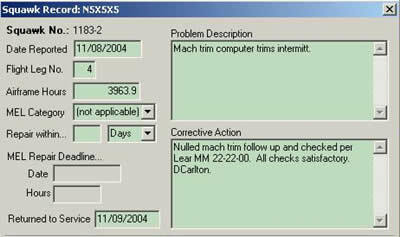 Remaining times for Parts and Maintenance Action records are automatically updated as time is logged to the aircraft. The Aircraft Reports library includes standard aircraft status reports including Pending Maintenance, Pending Discrepancies and Deferred Maintenance. As with all of CharterLog’s report libraries, the standard reports can be customized, and new reports can be added as per your needs. Click on the report names in the menu to the right to view sample reports in Adobe Acrobat format. CharterLog XMS utilizes a completely dynamic reporting system. Report templates are stored in a special report library database which can be updated via the Internet, using the built-in update facility. Report pull-down menus are dynamically created from the report library. So, as new reports are added to the library, they automatically appear in the appropriate menu. In addition, computer savvy users can use the built-in Report Designer to modify existing reports or create new ones. If you are unfamiliar with designing report templates or if you need specialized reports, Polaris Microsystems offers report design services. Custom report design services are available to registered customers who have a current product update contract in effect. 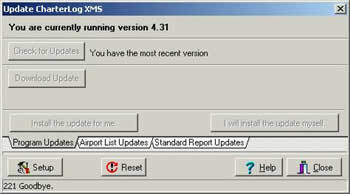 Obtaining and installing software, airport list and report library updates is easy, using CharterLog XMS's built-in Update facility. All you need is an internet connection. Downloaded updates are saved in a special Updates folder inside your data folder. So, once an update has been downloaded, it is available to all network workstations running the program. There is no need to download the update for each individual workstation. Program, report and airport updates are available to customers with a current Update and Report Design Services contract in effect. 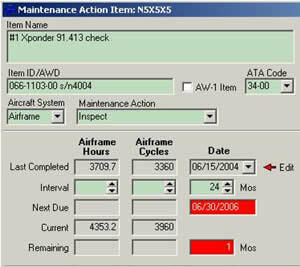 Parts Inventory - CharterLog XMS incorporates a "virtual" Inventory database which holds Parts records which are not currently installed on an aircraft. Tags of various designations (Identification, Serviceable, Repairable, Condemned) can be printed for inventoried parts. Mechanic Tracking - Recurrent training, on-the-job training and RII authorizations can be tracked for any number of aircraft mechanics. Vendor Tracking - Outside maintenance vendor facility audit information, approved activities and specific aircraft type approvals can be tracked via the Approved Vendors database. Report Export - Reports and/or report data can be exported to following formats: Lotus 123, Quattro Pro, Excel, Bitmap, JPEG, WMF, TIF, HTML, XHTML, PDF (Adobe Acrobat) and RTF (Word, WordPerfect, etc.). Pilot Logbook Export - Individual pilot flight log information can be exported to 20 different formats, including Excel, Lotus, Access, dBase, RTF, Word, SQL, CSV and others. Program Access Control - Using the companion CharterLog XMS Access Utility, an encrypted list of usernames and passwords can be created to control and manage access to the program. Each user can be assigned a set of permissions which control the program areas and functions accessible to that user. Database Manager - The built-in Database Manager Utility provides data folder management, table checking and reindexing, backup and restore, and previous-version import functions. A stand-alone version of this utility is also included. Product updates and Report design services are available to customers who have a current in effect. The purchase prices stated below include a one (1) year contract which expires at the end of the 12th month after the purchase date. At the end of this period, contracts can be renewed for 1, 2 or 3 years at the prices stated in the Purchase Information table. Product Updates include software updates and report library updates. Report Design Services include design of custom reports and forms for inclusion in the Reports library. Polaris Microsystems, LLC retains ownership rights to all reports we design for customers, and reserves the right to include these reports in future Report Library updates made available to all current and future customers. NOTE: There is no charge for phone or email technical support. These services are available regardless of the contract status. Prior to purchase, you can try CharterLog XMS for free. Just download the install file from our Download page and install it on your computer. The program will run in Demo mode for 15 usage days. (Each day that you start the program at least once counts as one "usage day".) In addition, demo mode restricts data entry to 1 pilot and 20 logbook entries. Minimum 40 MB hard drive space (empty data files). 800 x 600 display resolution (minimum). Includes software updates and report library updates. Report design services include design of custom reports and forms for inclusion in the Reports library.